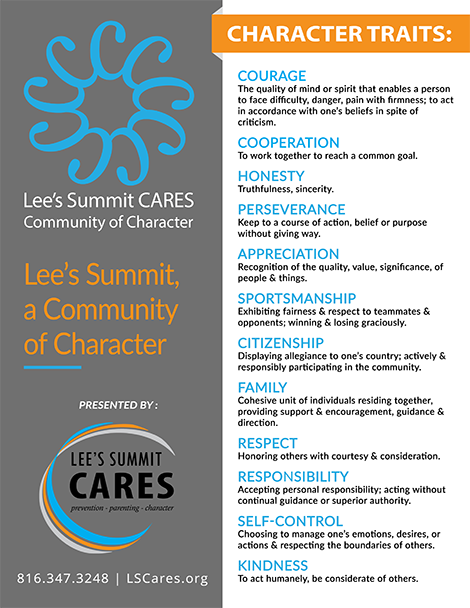 Lee's Summit is a Community of Character committed to character development. Lee's Summit CARES has formed the Lee's Summit Character Council whose goal is to establish Lee's Summit as a Community of Character. We have leadership involvement from important sectors in our community; family, schools, city government, law enforcement, parks and recreation, media, business, faith and health care. To strengthen our community by promoting, encouraging and equipping the development of character in every sector of the community. Since 2004, Lee's Summit CARES has hosted the Mayor's Character Breakfast - a celebration of character in the Lee's Summit community. During the breakfast, members of our community receive the prestigious Reflections of Character award.